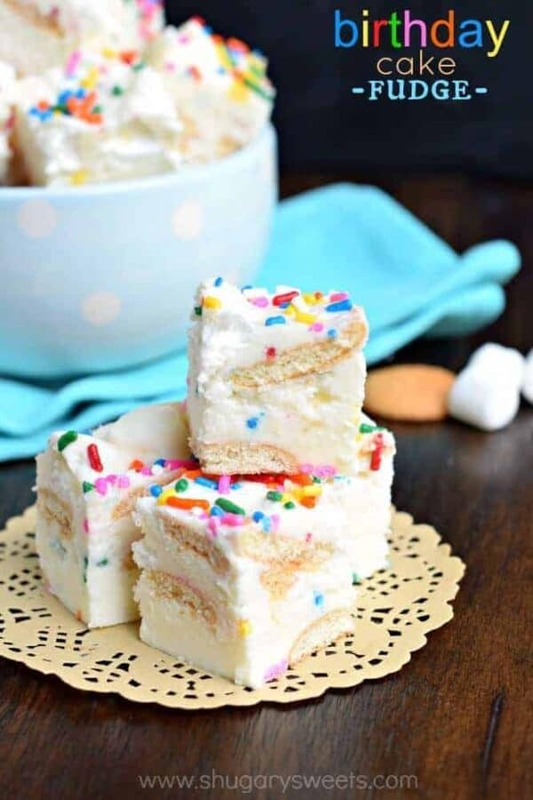 Birthday Cake Fudge is a fun, festive Disney inspired treat. 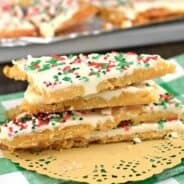 Packed with cookies and marshmallow, this is one dessert you can’t resist! I can’t take the credit for the idea for today’s recipe. This one comes from my friend Amber, one of the editors over at Food Fanatic. She was describing a fudge she used to enjoy at a Disney theme park, and asked if I could give it whirl. She knows that perfecting how to make vanilla fudge is one of my special powers. I seriously have no idea if this is anything like that fudge, having never tried it. However, this recipe is amazing, if I do say so myself. I don’t know about you, but birthday cakes are the best. They don’t have to be elaborate, I prefer them without fondant, but I want them to be packed with flavor (and frosting). In my ideal world, I would choose either a chocolate cake with vanilla frosting….or a funfetti cake with funfetti frosting. I mean, it’s sprinkles. Who doesn’t love sprinkles? 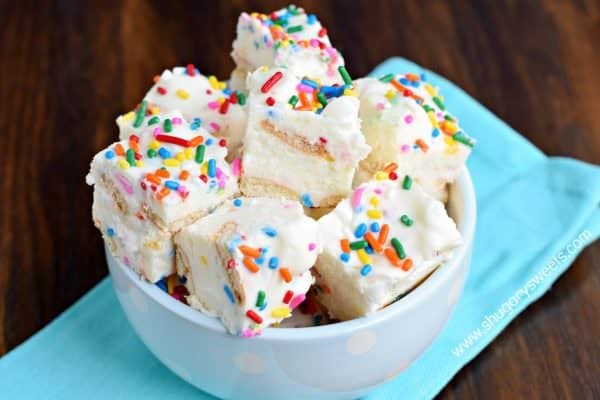 Today’s Birthday Cake Fudge recipe is a true winner. It will make that next birthday memorable. From the fun and festive sprinkles, to the little crunch inside…to the OMG oooey gooey delicious marshmallows. WINNER. ‘nuff said. I’ve got a few notes about making this fudge. Use the mini Nilla Wafers if you can find them. This will make cutting the fudge and not having too much “crumble” so much easier. If you can’t find the minis, I would break each cookie in half. For the sprinkles, I like to use jimmies. You know, the log shaped sprinkles. NOT the balls. One, those balls are like glitter from the devil, one spill and you’ll be finding them on your floor and counter for years. Two, I think the jimmies taste better. Before you start melting your butter and cream mixture, get your other ingredients ready. First, add your white chocolate and marshmallow fluff to your mixing bowl so it’s ready to melt when you add the hot cream mixture over it. Second, line your 8 inch baking dish with parchment paper. Toss a few cookies (wait, that sounds wrong) into the bottom of the dish (don’t cover the bottom, but add a few cookies). Once your mixture in your saucepan is boiling, set your timer for 4 minutes. No candy thermometer needed, just boil (ROLLING BOIL) for 4 full minutes. Then pour it over your white chocolate and marshmallow mixture. In a bowl with an electric mixer, this will only take about one minute to blend, as the white chocolate will melt quickly! 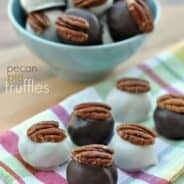 Check out some of my other favorite truffle and candy recipes! 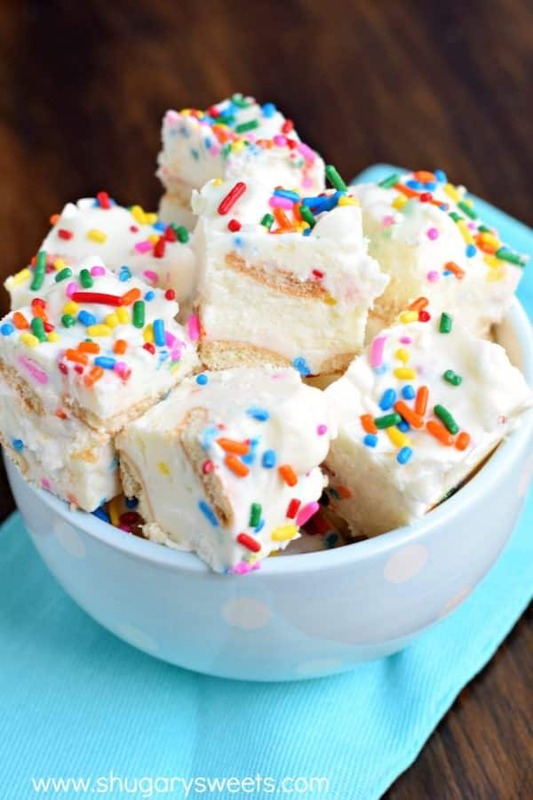 Be sure to stop over at Food Fanatic and print the Birthday Cake Fudge recipe! Aimee, just wow! This looks incredible! I love birthday cake anything so this is going into my “make this stat” file! I don’t know what I’m going to make this for… But I’m definitely going to make it- SOON!! Now that’s one yummy sounding fudge!!! I love finding pockets of soft marshmallows in my fudge…so good!!!! I think 2 tsp. of vanilla extract would take this over the top. Thanks for the recipe. Hello! 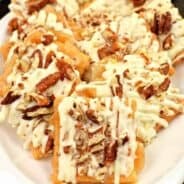 What would you use to substitute to make into a Halloween fudge?